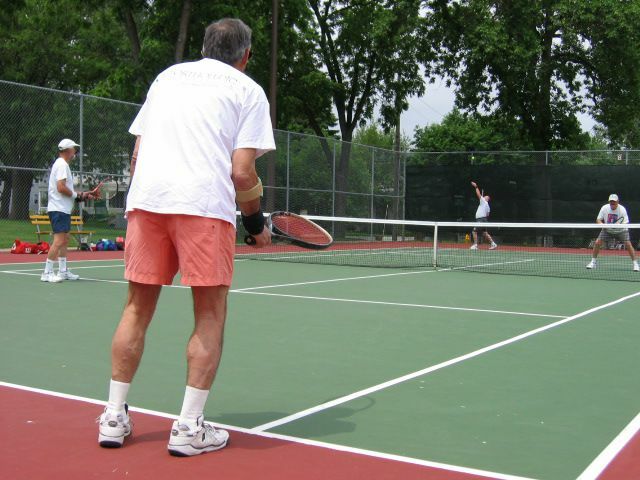 Richard is a 56 year old male and avid tennis player. He came to see me 2 weeks after suffering an injury while playing tennis. Richard is a 56 year old male and avid tennis player. He came to see me 2 weeks after suffering an injury while playing tennis. Richard stated that he jumped up to serve the ball in a tennis match against his wife and it felt like someone threw a ball or kicked him in the back of his leg. He said there was some pain but more than any thing he noticed instantly he had some trouble getting around and felt “weak” in his ankle. Richard saw his primary care doctor a few days later. X-rays were obtained and it was noted that there weren’t any fractures, but his primary care physician set Richard up an appointment to see me, Dr. Gumbiner. Richard’s history is spot-on for an Achilles Tendon Rupture. His clinical exam confirmed my suspicions and we ordered an MRI and made him non-weight bearing in a splint with crutches. The MRI showed a complete rupture with approximately 2cm of gapping at the 2 ends of the tendon. I advised Richard that surgery would be in his best interest at this time. Unfortunately, Richard suffered from severe anxiety and stated that he did not want to do surgery and felt as though his injury was “not that bad.” I warned him that if he continued to walk and not undergo any treatment it is likely he will do more damage and require more extensive surgery. Richard came back to see me 5 months later. He complained of severe weakness in his leg. He was unable to push down with the affected ankle. He could not participate in his regular daily activities due to weakness and pain. He noticed a thick knot of tissue in the back of his leg in the area of the rupture. He also started to develop significant hammertoe deformity on the affected side. We repeated the MRI. It showed significant scar tissue that took up approximately 7 cm of the Achilles tendon. His muscle strength was minimal. I advised Richard that he would now require a tendon transfer to restore function and decrease pain to his lower extremity. Richard underwent the surgery. We excised all of the scar tissue and transferred another tendon from the back of his leg to replace the pull of the Achilles. Richard’s recovery followed a normal course and believe it or not he was able to return to playing Tennis 6 months after the surgery. Richard had a good result and only wished he had the surgery done sooner. As his surgeon, it is likely he would not have required the tendon transfer if we had addressed the issue to begin with. Achilles tendon ruptures are quite common. If treated conservatively can have as high as a 50% re-rupture rate. Surgical treatment results in approximately a 10% re-rupture rate. Although surgery is not the answer for everyone, early detection and prompt treatment is imperative for a good functional result. If you are playing a sport and “hear a pop,” in your foot or ankle.” Don’t hesitate; give one of our doctors at Indiana Podiatry Group a call!